Sporting KC – Page 224 – Welcome to Wyandotte Daily! Sporting Kansas City welcomes the New York Red Bulls to Sporting Park in Kansas City, Kan., on Tuesday in a match that features Major League Soccer’s top two teams from 2013. The match will be nationally televised on ESPN2 and ESPN Deportes with coverage beginning at 6:45 p.m.
Tuesday’s match will be the 44th consecutive sellout crowd at Sporting Park. A limited number of tickets are still available – including standing-room only tickets – and are available for purchase at Ticketmaster.com or by calling 888-4KC-GOAL. The first 15,000 fans through the gates will receive a replica MLS Cup championship ring. Sporting KC and New York are both experiencing a short turnaround as Sporting KC played Toronto FC at home on Friday night and New York was host of the Portland Timbers at Red Bull Arena on Saturday. Sporting Kansas City striker Dom Dwyer scored twice in the club’s 2-2 draw with Toronto FC and sits atop the MLS goals chart along with fellow Englishman and New York Red Bulls forward Bradley Wright-Phillips. Dwyer and Wright-Phillips each have 10 goals this season heading into Tuesday’s Eastern Conference match. Dwyer has scored in Sporting KC’s last four matches, a feat only Preki (1996) and Eddie Johnson (2007) have accomplished in the team’s 19-year-history. With a goal against New York, Dwyer will surpass Johnson and join Preki as only the second Kansas City player to score in five straight matches. Wright-Phillips also scored in his team’s last outing, a 2-1 loss to the Portland Timbers. New York has not lost three consecutive matches since June 2013 and have not lost four straight since 2009. Tuesday will be Sporting KC’s sixth of seven matches in a 28-day span. The Red Bulls will play their fifth of five games during that same time frame. The last time these two clubs met, New York defeated Sporting KC 3-2 at Sporting Park with goals from Jonny Steele, Fabian Espindola and Lloyd Sam. Sporting KC’s Dwyer also tallied in that match, marking the first goal of his MLS career. Sam leads New York in assists this season with five. Another scoring threat for the visitors will be Designated Player Thierry Henry, who heads into Tuesday’s match with three goals and four assists. Since the start of the 2011 MLS regular season, Henry ranks third with 42 goals in 88 starts. In seven matches against Sporting KC, Henry has zero goals and one assist. After the conclusion of Tuesday’s match, fans are welcome down to the pitch to watch Matt Besler, Graham Zusi and the U.S. Men’s National Team face Azerbaijan. The match will be shown on the Sporting KC videoboard as well as in the Boulevard Members Club. The friendly is part of the Send-Off Series as the USMNT prepares for this summer’s World Cup in Brazil. Sporting Kansas City defender Chance Myers will undergo surgery on Wednesday to repair a ruptured Achilles tendon in his left ankle and will miss the remainder of the 2014 season, the club announced. Myers suffered the season-ending injury in the 36th minute of Sporting Kansas City’s 2-2 draw vs. Toronto FC on May 23. 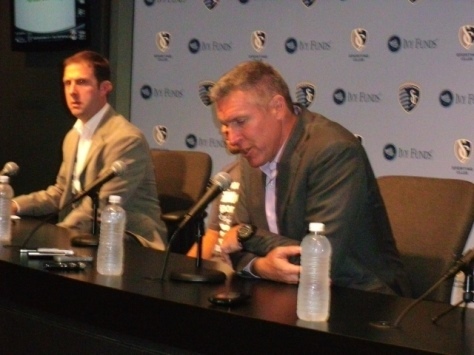 “First and foremost, I am very upset for Chance,” Sporting KC manager Peter Vermes said. “He has worked very hard and always takes care of himself to make sure he is prepared to play. Getting a serious injury is never an easy thing to cope with, but I have full faith that he will work hard to come back and continue to be an important member of our club. Kansas City drafted Myers with the No. 1 overall pick in the 2008 MLS SuperDraft. Over the past seven seasons, Myers has appeared in 123 regular season games and has started more than 100 games in all competitions. 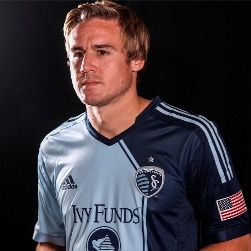 Myers re-signed with Kansas City prior to the 2014 season after tallying two goals and three assists during Sporting KC’s MLS Cup championship campaign. The UCLA product has represented the United States at the U-18 and U-20 levels and trained with the USMNT during the 2014 January camp. Wednesday’s surgery will be performed under the care of orthopedic surgeon Dr. Matthew Kneidel. At last night’s game Sporting Kansas City tied with Toronto. The score was Sporting Kansas City 2 and Toronto 2. One of the reasons the game ended in a tie was that two of the key players were away training with the World Cup championship to be held in Brazil. 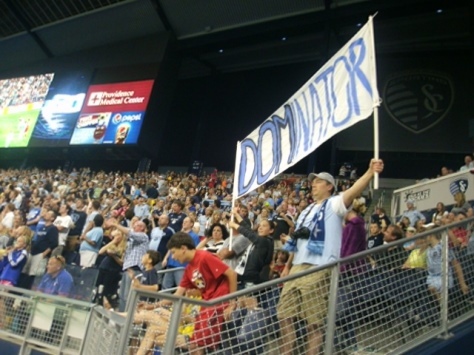 The player that made the goals for Sporting Kansas City was Dominic Dwyer, No. 14. “The whole team tried as hard as they could. We all work together to get the job done, however Montréal is a tough team to beat. This is why the game ended in a tie match. I’m really proud of my team members,” Dwyer said. The next game will be next Tuesday night and Sporting KC is getting prepared for it. Vermes said he hopes Sporting KC will win that match. The next game will be held at 7 p.m. May 27 at Sporting Park. They will play against the New York Red Bulls. This game is expected to be one the most challenging games ever in the history of Sporting Kansas City, as the team is without two of its key players.